Professor Xin-Fang Wang was born in Henan, China in 1934 and received his M.D. at the Tongji Medical University , Wuhan in 1958. He became Associate Professor of Medicine at the University in 1980 and was Director of the Echocardiographic Division of the Union Hospital of the Tongji Medical University in the same year. He became Professor of Medicine and Deputy director of the Cardiovascular Disease Institute of the Tongji Medical University in 1986, a position which he has held up to now. Professor Wang started his research activities in ultrasound in 1961and was among one of the few pioneers in ultrasonography and echocardiography in China. In 1962 he developed diagnostic criteria for liver abscess, pleural and pericardiac effusion and the study of ultrasonic echolucent areas in the abdomen. In 1963, together with gynecologist Ji-Peng Xiao , he reported on the sonographic findings in 261 abnormal pregnancies and the M-mode echographic study of the fetal heart (in the chinese language) which probably constituted the earliest of such reports in the medical literature. In 1964, Professor Wang produced prototype echocardiographic equipments synchronized to electrocardiographic and phonocardiographic signals and laid important foundation for subsequent echocardiographic research. In the same year his group published important works which clarified mechanisms of various valvular echo patterns. 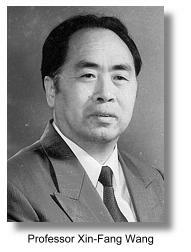 He was editor of the 'Textbook of Echocardiography' in 1975 which was widely read by researchers in China. In 1978 Professor Wang pioneered hydrogen peroxide contrast echocardiography and in 1983 described left-sided contrast echocardiography. Subsequent to his work contrast agents have been applied in medical ultrasonography all over the world. This research work was awarded first place in the advanced prize of science and technology by the Ministry of Public Health and third place in the advanced prize of science and technology by the State Council. In 1985 he turned to Doppler color flow imaging. His book 'Color Doppler Diagnostics' was awarded the second place in the advanced prize of science and technology by the State Education Commission in 1991. 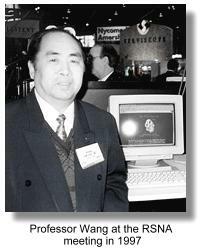 Some of Professor Wang's other important work included "Biplane transoesophageal echocardiography", "The relationship between intracardiovascular smoke-like echo and erythrocyte rouleaux formation", "Clinical application of three-dimensional transoesophageal echocardiography (1994)" and "Four-dimensional echocardiography: Methods and clinical application (1996)". Some of his articles have been published in the American Heart Journal. Professor Wang has published more than 120 scientific papers and 7 textbooks on echocardiography. He is currently the Vice-president of the Society of Ultrasound in Medicine of the Chinese Medical Association and the Echocardiographic Society of the Chinese Association of Ultrasound in Medicine and Engineering. He is also member of the Board of Directors of the International Cardiac Doppler Society and the International Society of Cardiovascular Ultrasound. In honor of Professor Wang's pioneering research activities and achievements in ultrasound diagnosis, he was presented the "History of Medical Ultrasound Pioneer Award" by the World Federation of Ultrasound in Medicine and Biology (WFUMB) in 1988. His current research interests are in transoesophageal echocardiography, transpulmonary contrast echocardiography and 3D and 4D echocardiography. Also read a short history of the Early development of ultrasonography in China. (partly in chinese). Bottom picture courtesy of Dr. Jing Deng.